A common belief among the superstitious is that opening an umbrella indoors is bad luck. The claims of unfortunate events include bad luck for all of the people inside the building and even death to a family member before the years end. Of course, there is no scientific evidence to substantiate these claims. However, by examining the possible origins of this superstition we are better able to understand why people believe in this fallacy. One possible origin for today’s belief is the European umbrella that was popular in the eighteenth century. These umbrellas were larger than modern umbrellas and had hard metal spokes and spring triggers. The opening of these umbrellas could cause damage to objects or people that happened to be nearby. 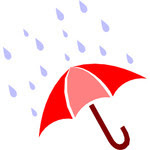 Therefore, it was considered bad luck to open an umbrella indoors, because of the many cases in which people broke something or injured someone with them. One article suggested that the superstition of bad luck may have been created on purpose to reduce the number of accidents created by the umbrellas. Superstitions involving umbrellas are also present in ancient Egypt, long before the creation of eighteenth century umbrellas. Unlike those umbrellas, ancient Egyptian umbrellas were to protect their users from the sun’s rays rather than from rain. It is believed that at this time, opening an umbrella inside was considered a sign of disrespect to the sun god. This superstition reminds me of the myth about only being able to use ten percent of our brains and the myth about sugar making children hyper because although there is no proof to support the claims many people still believe the notion. The idea is promoted through word of mouth and it taught to each generation. For the most part, parents probably tell their children this myth so that the kids don’t break anything or hurt themselves by playing with umbrellas indoors. I can't say I never opened an umbrella indoors before, because I most definitely have. But in all the cases I can remember, I don't recall ever breaking anything or hurting someone. I'm not a big believer in the Egyptian faith, only because I really don't know too much about it and don't live in that area of the world, but I don't think I upset the sun god; at least I hope I didn't.